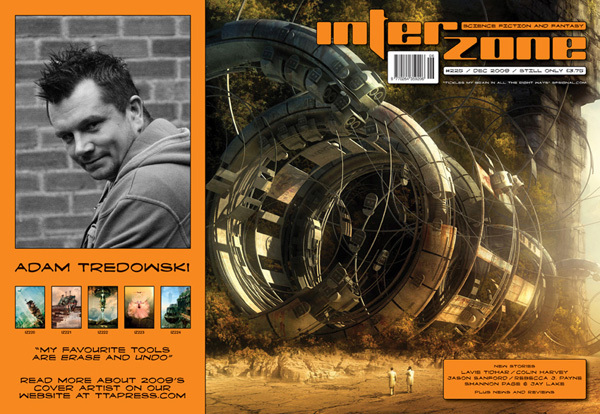 Interzone issue 225 has 2009's sixth and final cover art by Adam Tredowski. That's him on the back of the wraparound cover, and an interview with Adam will appear on this website shortly. The issue contains new stories by Jason Sanford, Lavie Tidhar, Rebecca J. Payne, Colin Harvey, Shannon Page and Jay Lake, with illustrations by Mark Pexton and Warwick Fraser-Coombe, plus all the usual news and reviews. More details and extracts will appear on Interzone's Current Issue page, along with a proper thread for this forum, a bit nearer publication time, which is November 12th. Meanwhile, please don't forget to check the status of your subscriptions (see insert for reminder), or take out a new subscription now. Thanks! For what it's worth, the proofreader reckons this is one of the strongest selections of stories IZ has published. ‘By Starlight’ is the first story Rebecca J Payne submitted to any magazine or publisher and, as such first time success is very difficult, its immediate acceptance suggests that she has all the attributes necessary to make a career as an author. Beautiful looking cover, my favourite so far. Gorgeous.